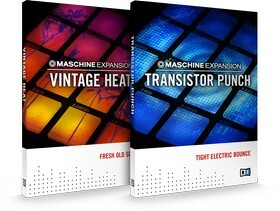 Native Instruments has released Vintage Heat & Transistor Punch, two new titles in a series of MASCHINE Expansions, affordable high-quality download libraries for its acclaimed groove production system. 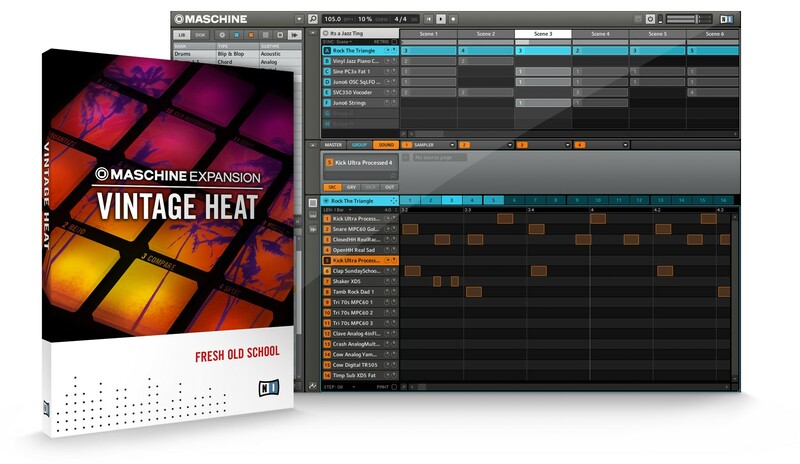 All expansions provide new drum kits and instruments as well as pre-programmed patterns created by expert sound designers and producers, and feature a distinctive take on a contemporary sound aesthetic or musical style. The series debuts with VINTAGE HEAT and TRANSISTOR PUNCH, created by Goldbaby and Surround SFX. VINTAGE HEAT was created by distinguished sampling artist Goldbaby, and specializes on warm, saturated sounds with typical vintage grit. 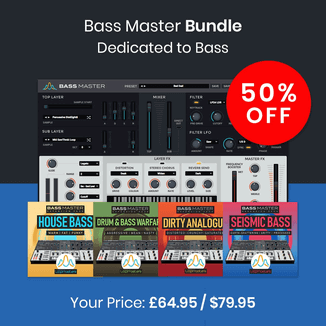 The library includes 50 charismatic kits with analog, digital and acoustic origins, complemented through 50 matching synthesizer sounds ranging from bass and leads to brass, pads and strings. All sounds in VINTAGE HEAT have been sampled from vintage drum machines and sought-after analog synths, and have been extensively processed with Goldbaby‘s unique array of classic compressors, effect units and valve tape machines to achieve his special signature sound. Inventive sampling techniques, including the mapping of successive tape delay repeats to different velocity layers, further contribute to the original and distinctive character of the VINTAGE HEAT library. 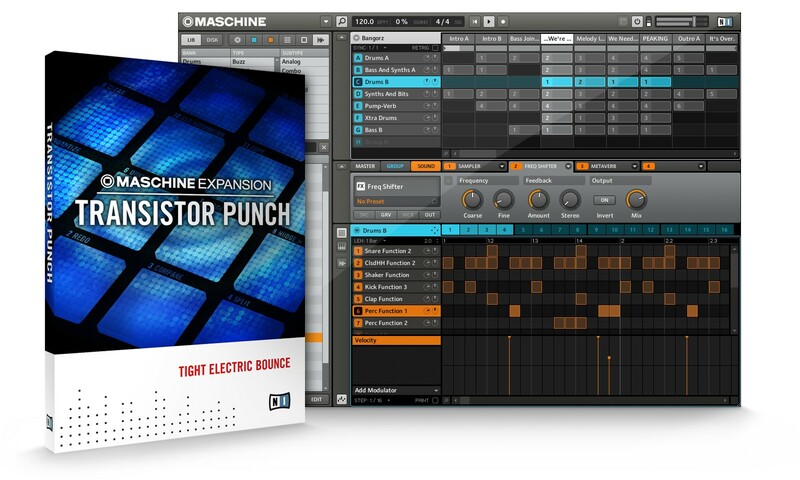 TRANSISTOR PUNCH takes its inspiration from contemporary European club music, and provides extremely crisp and punchy sounds for a wide range of electronic styles. 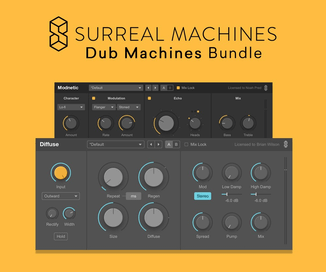 Created by renowned sound designer Denis Gögdak of Surround SFX, the library contains 30 energetic drum kits as well as 50 new bass and lead sounds that integrate seamlessly with the factory library of MASCHINE. 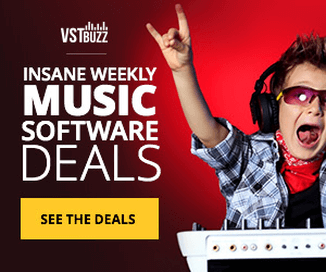 All sounds have been sampled from analog drum machines and synthesizers as well, to be meticulously processed with modern high-end outboard gear for an especially defined, forceful sound. TRANSISTOR PUNCH also adds 20 sophisticated multi-effect chains that provide instant sonic treatments for any groove, as well as a large collection of patterns by acclaimed producer Martin Buttrich. Vintage Heat and Transistor Punch are available for download purchase for $59 USD / 49 EUR each.